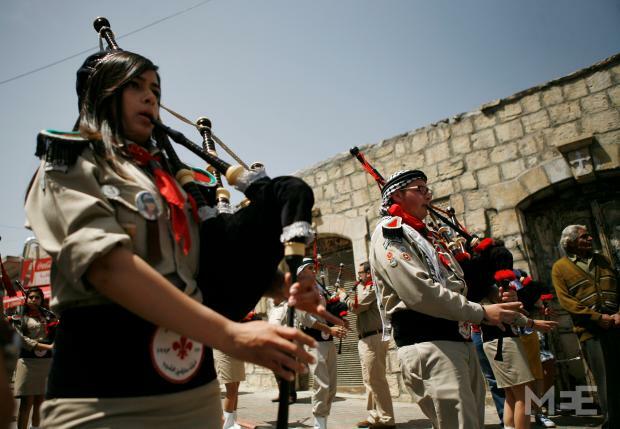 RAMALLAH, Occupied West Bank – Beating drums, loud bagpipes and shrill trumpets filled the air in Ramallah on Saturday, when 14 lively Kashaf (Scouts) marching bands paraded in front of an audience of thousands of Christian and Muslim Palestinians. 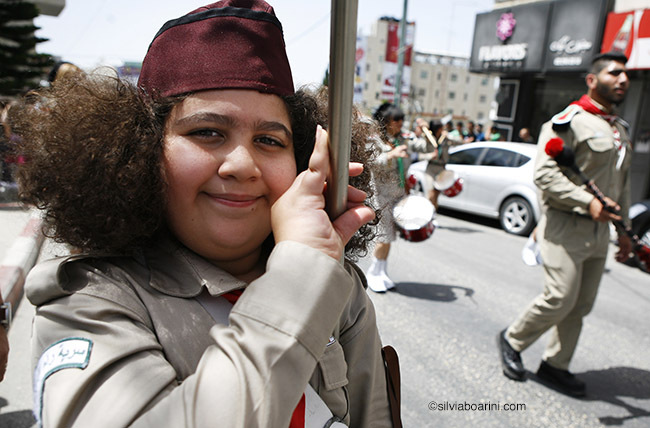 Spectators began lining the streets during the hottest hours of the day in order to attend the traditional Sabt al-Nour parade marking Orthodox Easter; and for the first time in years, out of 14 Scout groups, one was from Gaza. “We got our permits a few weeks ago to come through the Eretz checkpoint,” beamed 16-year-old Haneen Jilda from Gaza. 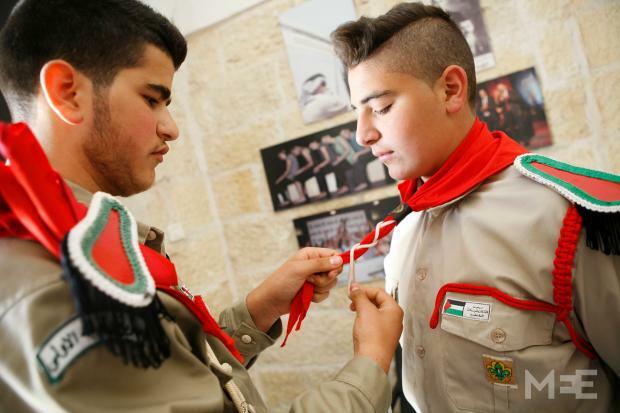 Although the paperwork was in place, the Gaza scouts, who are “sea scouts” and wear white sailor-like uniforms, knew that until they had actually crossed Eretz, they could still be turned back for any reason. But they made it, Jilda sighed. “It’s the first time and we will stay for a few days,” she added. Saturday’s event lightened the heavy atmosphere for a few hours as the West Bank has witnessed a rise in violence since last September. Only a few days ago a young Palestinian woman and her brother were killed by Israeli soldiers after an alleged stabbing attempt at the nearby Qalandia checkpoint. 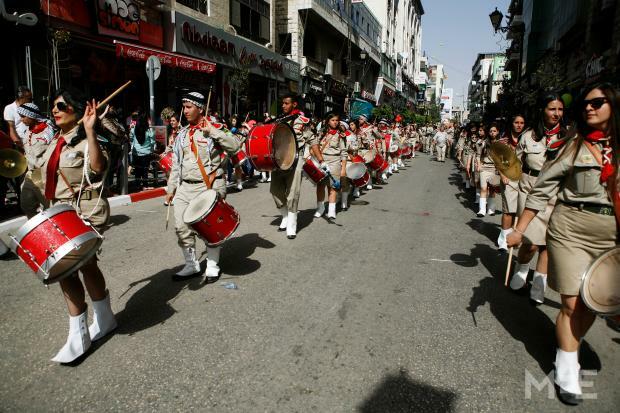 The Sabt al-Nour parade culminated in the central square of al-Manara where a car escorted by Palestinian police delivered the Holy Fire hailing from the Church of the Holy Sepulchre in Jerusalem. Due to Israel’s ongoing military occupation of the West Bank and Gaza, Palestinians are barred from travelling freely to Jerusalem. 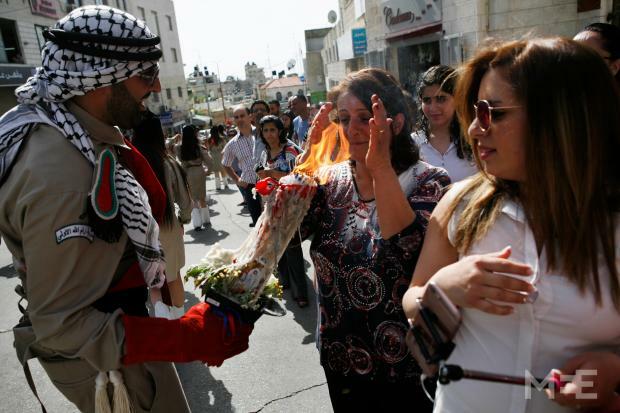 Imposed travel restrictions mean most worshippers are unable to attend celebrations in Jerusalem or to bring the Holy Fire back to their homes themselves. 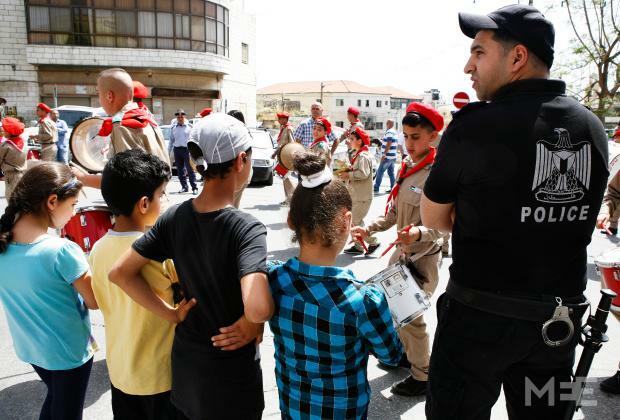 In order to reach worshippers in Ramallah, the Holy Fire must also cross the checkpoint of Qalandia as well as many other checkpoints on the way to villages across the occupied Palestinian territories. According to Orthodox tradition, the Holy Fire that lights up on Jesus’ tomb every year on the day following his crucifixion hails from heaven. 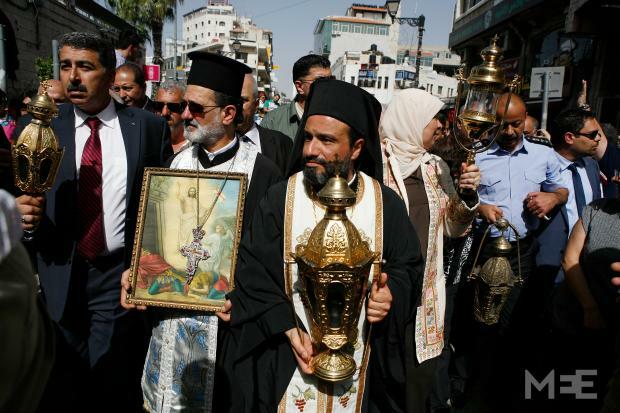 It is brought out to the people by the Orthodox Patriarch of Jerusalem, who receives it in the tomb chamber in the Church of the Holy Sepulchre. The rite has been performed for the past 1200 years and signifies that Christ will resurrect from his grave on Easter Sunday. The flame is used to light a number of candles which are then delivered to Orthodox communities across Israel, the occupied West Bank and Gaza. 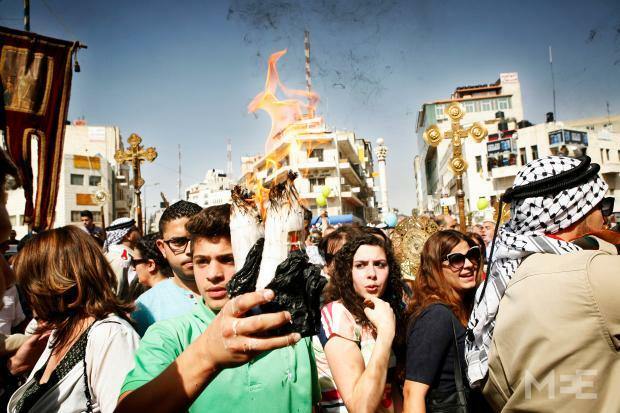 Once the Holy Fire reached al-Manara square, the Kashaf lit large candles which they paraded down the streets. Worshippers used the fire to light lanterns which they will keep burning in their homes all year round. 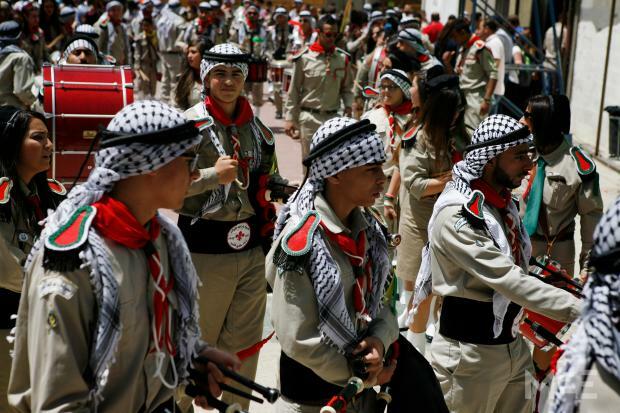 The annual parade is a yearly reminder of Palestine’s mixed heritage and a celebration of its rich history and national identity. 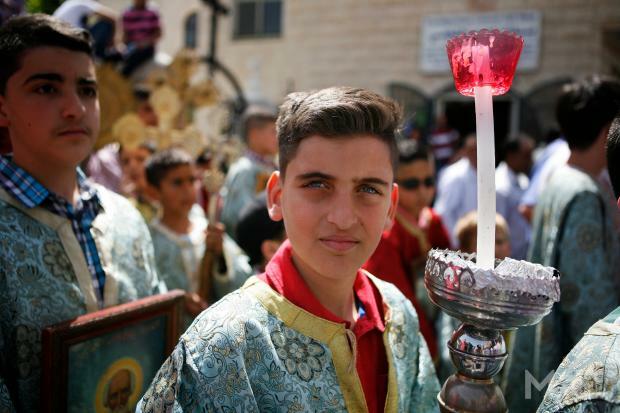 Some 50,000 Palestinian Christians live in the West Bank and Gaza, but this minority suffers from the highest rate of emigration and continues to shrink. Once a predominantly Christian village, Ramallah is today home to 7,000 Christians out of a population of just under 60,000. 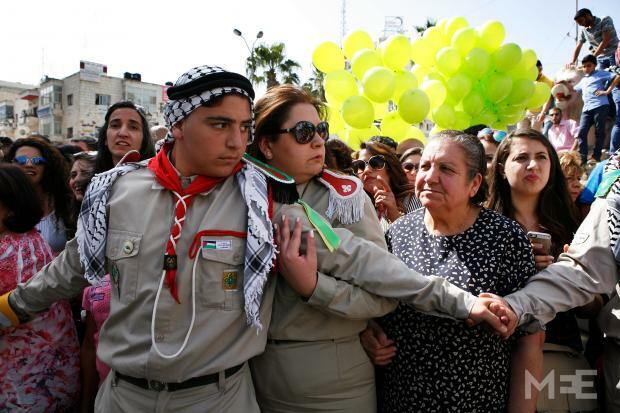 In his Easter message to the press, Palestinian President Mahmoud Abbas stressed the importance of maintaining religious diversity in the Middle East.